Last week, a work lunch took me to Grill'd for the first time in a long, long time. Their menu is getting ever better for veg*ns - there are still the three veggie burgers (the garden patty is excellent), but now there are three chip choices and all vegan friendly! 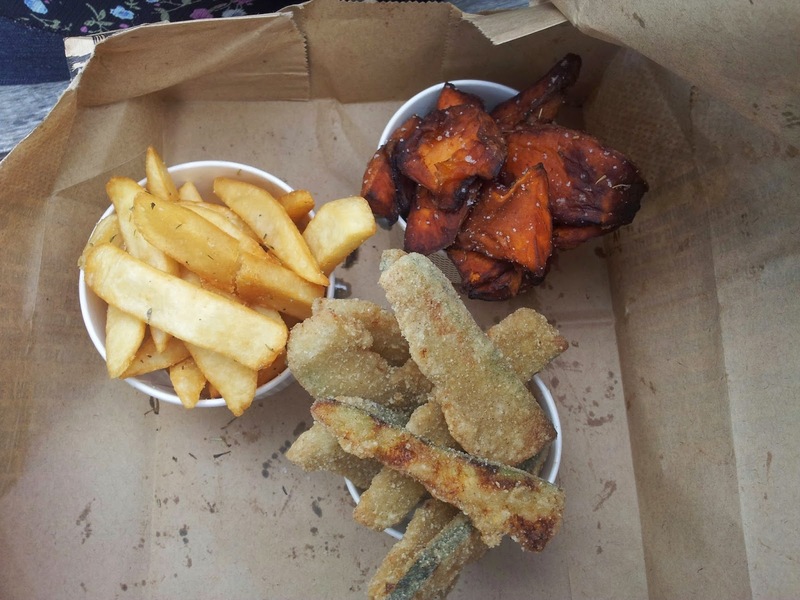 As well as the herb-salted chunky fries, you now have the option of salted sweet potato chips or crumbed hunks of zucchini. They're all great choices. So good, in fact, I hit up my local for a round of chips a few days later. All three of these are tasty. Grill'd do some of my favourite potato chips in Melb, the rosemary salt makes them a little more interesting than the standard chip. The zucchini fries are very well executed - not overly greasy, and the crumb coating is paper thin and super crunchy, with the zucchini still fresh and green inside. The only negative is they're pretty bland. Zucchini's pretty plain on its own, so some cajun seasoning or some fresh herbs would make these incredible. Get them with a dipping sauce, they need it. The sweet potato, though, are by far the best commercial sweet potato fries I've tried. They look charred but they're definitely not - there's a slight crunch and the insides are tender without being mushy or dry, which is hard to do with sweet potato. Eaten out of a paper bag on a park bench watching the sunset, it was perfect. Well done to Grill'd for upping their vegan game - I'm hooked!